Old Store Stock! 1950's MIP Vintage "Premier Pearl Necklace and Earring Set." 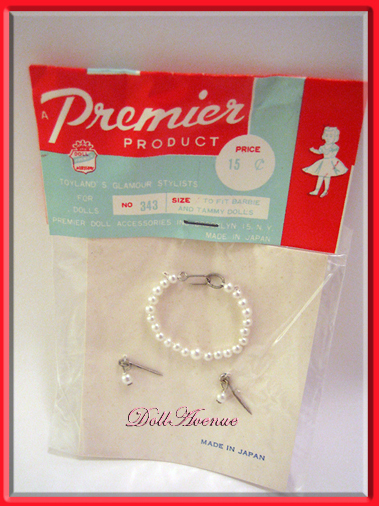 Beautiful, original vintage Premier doll jewelry sold separately in stores to accessorize many different types of dolls of the fifties and sixties. The set includes a graduated pearl necklace with hook and eye closure and matching pearl drop earrings. These pearls will fit most 10-12" dolls such as Barbie, Tiny Kitty, Tammy, Little Miss Revlon, Jill, and other similar dolls. It will also fit 8" dolls like Ginny, Muffie, Madame Alexander and more. The necklace measures 2" when laid out straight and the earrings are approximately 1/8" long. A wonderful vintage accessory for your doll with the original price of 15 cents printed on the front! *Special Note: I can mail these first class in a padded envelope. If you purchase one or more sets, I will refund the difference if it comes out less than the calculated shipping cost.